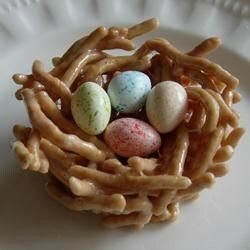 "Crunchy Chinese noodles and melted marshmallows make the cutest little nests for your jelly beans. Great as place markers at Easter dinner." Combine marshmallows and butter over medium heat in a saucepan; stir until the butter and marshmallows have melted. Stir in the chow mein noodles, coat well. Butter fingers and press the mixture into the bottom and sides of the prepared muffin tin. Refrigerate until firm. This was a hit at my daughter's preschool Easter party. I put the jelly beans in while the noodles/marshmallow were still warm and they stayed put very well. My family loves these. The only thing that I do different is use the pastel (Easter) peanut M&M's in place of the jelly beans. Use shredded wheat cereal..works/looks GREAT! !